This weekend, four of our closest college friends, along with their kiddos, are staying with us, and I cannot wait. 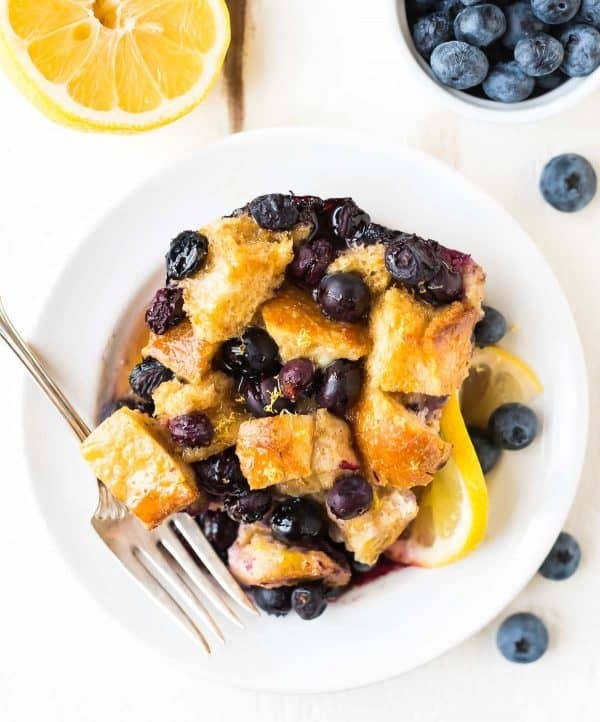 I already have visions of us staying up too late chatting, playing cards and silly games, and gobbling giant servings of this Lemon Blueberry French Toast for breakfast. It will be just like old times, but with better wine and everyone fighting to wash the dishes. Parties in your 30s are the best. 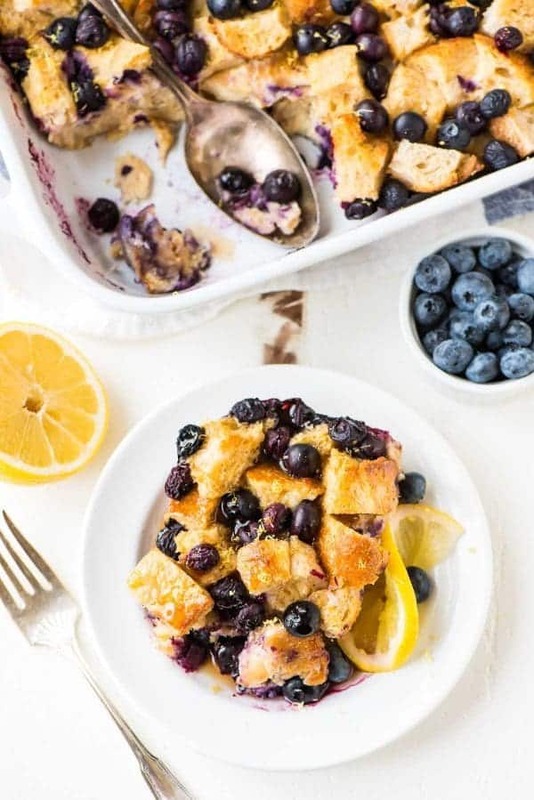 Whenever I’m making breakfast for more than two or three people, quick and easy overnight breakfast casseroles such as this Lemon Blueberry French Toast are my go-tos. Not only do they score full points with my guests, but because the (minimal) prep work all takes place the night before, in the morning I can focus on spending time with my guests instead of rushing around the kitchen. 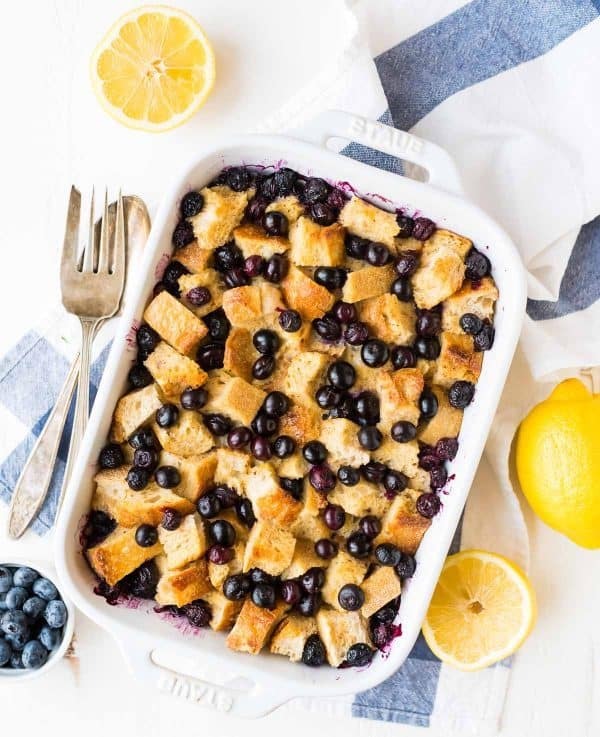 Plus, since this weekend’s guest roster also includes a sweet two-year-old and four-year-old who wake up ready to play at 6:30 a.m., I know that we less-than-dewy-eyed adults will appreciate a breakfast that requires no effort beyond popping a pan of ready-made blueberry French toast in the oven. Although I’d be excited to host our friends and their daughters on any weekend, I’m particularly excited that we’ll be together on Mother’s Day. One of the neatest things about growing older is seeing girlfriends I’ve known for more than a decade have children of their own. It’s both surreal and inspiring to watch my friend with her little girls, and I’m so happy we’ll be able to celebrate her Mother’s Day. Whether it’s your own mom, a friend, or someone else who has inspired you by her example, Mother’s Day is an opportunity to show a lady in your life that she is appreciated. Flowers and gifts are lovely of course, but I think one of the best ways to say “I love you” is with a home cooked meal…and the washing of the dishes afterwards. 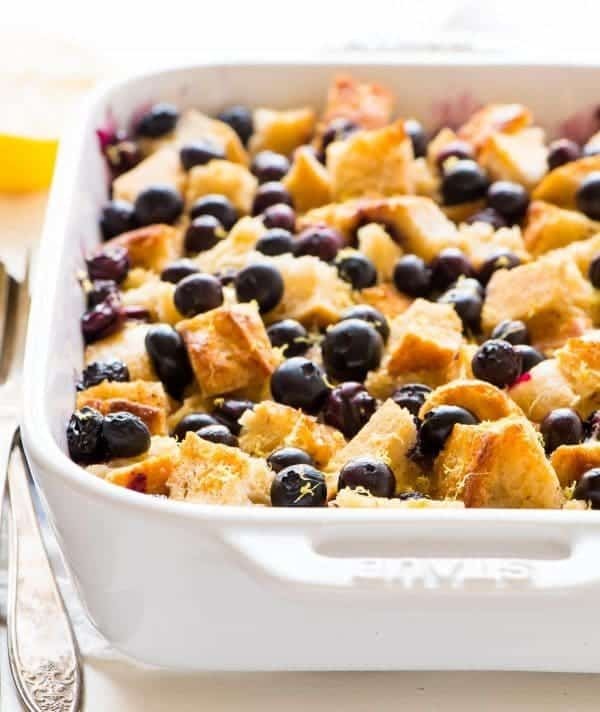 Looking for more easy and delicious overnight French toast casserole recipes? Check out this Everything Bagel Breakfast Casserole, Overnight Peach French Toast, and Coconut French Toast Bake. Another winner: Crockpot Egg Casserole! 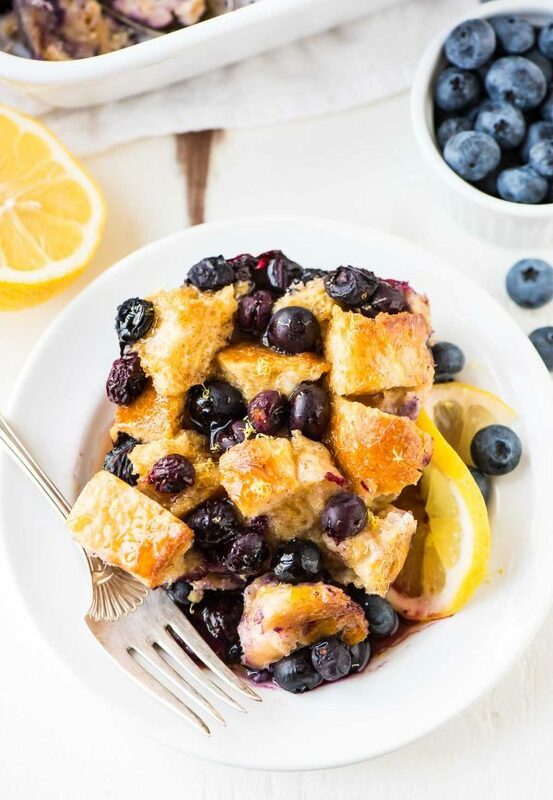 Overnight Lemon Blueberry French Toast Casserole. Easy, make-ahead recipe that's perfect for a crowd. Soft and fluffy, and every bite bursts with berries! Coat a 9x13-inch casserole dish with nonstick spray. Arrange the bread cubes (see notes if the cubes are still very soft or fresh) in an even layer in the pan, then sprinkle the blueberries over the top. Set aside. Looks and I’m sure tastes absolutely delicious! Looking forward to trying this dish very soon. My son who just returned from India, will love this at any time of the day! Thank you! Thanks so much, Suzy! I’d love to know what you think if you give it a try. I am absolutely salivating over this right now! So dreamy, I need this french toast in my life! This is a beautiful dish for mother’s day! hey girl- this looks so good! y’all have fun this weekend! Make ahead recipes like this are perfect for having guests over!! I love that your college friends AND their kids are spending the weekend with you. How fun! Hi there – this looks like a great recipe. Would it be ok if made with cows milk instead? Thank you! Hi Julie, yes, you can use regular dairy milk too! Hello Erin! once again it Mercy here from Kenya. Now, this is good! 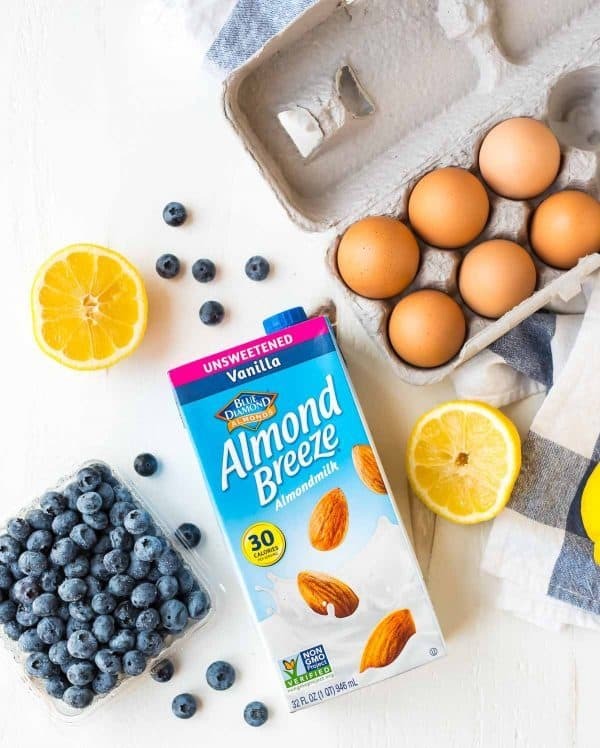 Do you have a sub for almond milk? can i use fresh milk or whole milk instead? please advice. Thanks! Hi Mercy, you can use whatever type of milk you prefer! I hope you enjoy the recipe! I made this for a neighborhood party and it was delicious! Even my husband who likes his French toast plain Jane (ie nothing fancy just cinnamon) really liked this and so did my 10 year old. It is perfect with some maple syrup on top. Not only does this taste good, but it’s so easy to make! I will be making this again! Hooray! I’m glad it was a winner, Jenny. Thanks for taking the time to leave this review!